This webinar will discuss the findings from interviews conducted by Hot Topics with HR leaders in fast-growing technology businesses such as Skyscanner, AirBnB, Pinterest and many others. 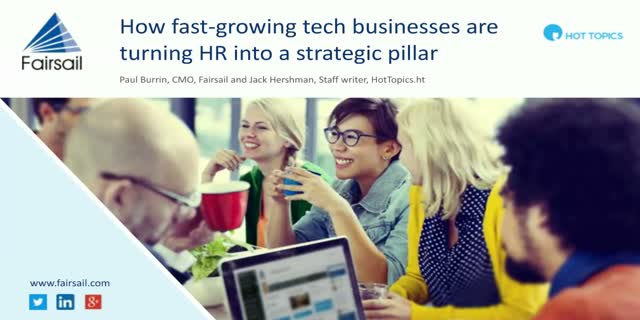 Hear from Hot Topics journalist, Jack Hershman and Fairsail CMO, Paul Burrin, about how these HR leaders are transforming their business and gaining competitive advantage and learn about some of the challenges faced and overcome. Why should brands care about employee experiences? How can HR and People leaders can use technology to shape this? And what are the secrets and tricks to enhancing your organizational brand and culture? Join Meghan M Biro of TalentCulture and Paul Burrin of Sage People, as they set out why employee experiences are so critical for success in today’s world of work, how to bridge the gap between HR strategy and senior executive buy in, and how to shape a great employee experience at every touchpoint. Is it about the perks? Or something else? Find out the secrets to creating the right place for employees to do their absolute best, ultimately driving your business. Building great workforce experiences is vital to the success of any organization. Its why fast-growth companies attract the best talent. Join HR Grapevine reporter Rianna Fulham and VP Customers for Life at Sage People, Chris Rauch, as they discuss why companies need to care about employee experiences, how HR leaders can use technology to shape this – and the secrets and tricks to enhancing your employer brand and culture, and retaining your best people. The race to win the talent wars is on. The way companies attract, engage and retain talent has changed – and traditional HCM applications are no longer able to meet the needs of organizations. HR leaders are recognizing they need solutions which can address evolving HR processes, and help them drive engagement and productivity across the business. • What are the top trends impacting HR that leaders need to know? • What are some of the new ‘must have’ capabilities for HR and People leaders? • How can business leaders use next generation HR solutions to get the best out of their people? HR is evolving – how will your organization adapt? Like the shift from personnel to HR in the 80s, there’s a new movement from managing “human resources” to managing people. Is this just a fad, a cosmetic change? Or is it fundamental to future business success? On this webinar, our guest host, Andy Swann talks to Kirstin Furber, People Director at BBC Worldwide and John Baldino, President, Humareso about what it means to be a people company and why organizations should be making that shift. They’ll be discussing the role of CPO; is this just a more modern title replacing CHRO or does this reflect a completely new role and responsibilities? What’s fueling this change? With the rise of the contingent workforce and gig economy, is people management a result of that? Join us for this lively discussion and hear the views of these thought leaders. With five generations now in the workplace, an awareness and understanding of generational differences is crucial. Having this knowledge will minimize conflict, increase teamwork and show you how to leverage each person’s strengths to contribute to the bottom line. Join Robin Throckmorton, co-author of "Bridging the Generation Gap" and President of strategic HR Inc., and Paul Burrin, CMO of Fairsail, for a lively discussion on the impact of the multi-generational workforce. It’s an invaluable opportunity to gain an understanding of how to effectively harness different skills and experiences for your business. Spencer Ogden is the global energy, engineering and infrastructure recruiter of choice. Founded in 2010, the company has undergone rapid growth scaling to over 350 employees across 15 locations worldwide. This drove the need for a global HR system that would streamline day-to-day processes and allow for a much better HR service that would deliver real business benefit. Learn more about why they chose Fairsail. This short 30 minute demo will take you through a high level overview of Fairsail's award-winning, global cloud HR system. Are you a global company struggling to answer simple management questions regarding employees quickly? Is getting basic employee information slow, painful, laborious and time consuming? Do you report reactively on the past? Does your data sit in silos across multiple sources without one version of the truth? If you face any of these issues in your HR team, then join this webinar to hear from Fairsail about how HR can fly on instruments instead of flying blind. Rocketship Education is a non-profit network of public elementary charter schools educating students, empowering teachers, engaging parents and inspiring communities. Learn how they're using Fairsail's global cloud HRMS to streamline HR processes, helping its teachers and staff achieve peak performance. SolarWinds has achieved tremendous growth through both organic and inorganic activity including 12 acquisitions over a three year period. With such a rapid increase in employee numbers, the company required a robust and scalable cloud HRMS to manage the entire workforce and provide better workforce visibility to management. This video explains why SolarWinds chose Fairsail's HRMS. Sage People, formerly Fairsail, enables mid-size multinational companies to manage workforces through its global, cloud HR and people system. We help companies to become People Companies.